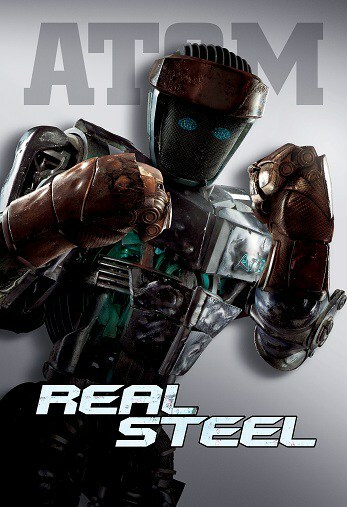 Atom is the “hero” robot of Real Steel, and the only one that has the appearance of a human face. He has blue LED lights that look like eyes, and there is a jagged line across the mesh on his face that looks like a mouth. He is also a bit less flashy than some of the other robots, but has some unique qualities that give him a fighting chance when he’s put in the ring. Atom has a feature called “shadow mode”, which means that he is able to duplicate any moves that he sees someone else do. Charlie (Hugh Jackman) then trains him with the moves he used to use in the ring before humans stopped boxing. We actually got to “meet” Atom in person; 4 of the robots from the movie were built to scale so that the actors would be able to give a more realistic performance. This was done at the advice of Executive Producer Steven Spielberg, who had had real dinosaurs and animatronics built for Jurassic Park. Atom’s past is shrouded in mystery. How did he come to be in that junk yard? Exactly who was he before Max and Charlie trained him? And was he recognized during his big fight? These are all questions a lot of us were asking, and hope to see answered in a sequel to Real Steel. Go see Real Steel, and then come back and tell me if you had the same questions as we did about Atom. What do you think Atom’s history will turn out to be? Keep up with Real Steel on Twitter and Facebook.